Prior versions: Sept 2015, June 2013. 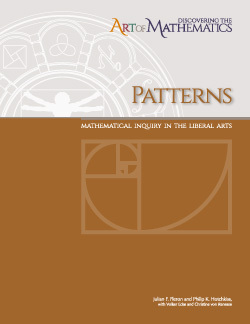 Discovering the Art of Patterns lets you, the explorer, investigate how mathematics uses the concepts and ideas of patterns to give meaning for mathematical structures. Using patterns you will explore the mathematics behind the naming of large numbers such as a millinillitrillion, famous Islamic Art, and spirographs. While investigating the connections between patterns and problem solving techniques, you will encounter a precocious elementary student who surprised his teacher with his ability to solve a busywork problem in a snap of insight, some combinatorics and discrete calculus as well as interesting families of numbers. Chapters on Pick's theorem, Patterns and Language in the Creation of Powerful Number Systems, Patterns Linear and Arithmetic, and Circles, Stars, Gears and Unity are solid and ready. Jo Boaler’s undergraduate students work on the Pennies and Paperclips task from Discovering the Art of Mathematics (see full details on youcubed.org). Her web site also has video of Steve Strogatz's students working on the "Pennies and Paperclips" game. See also Steve Strogatz's page at youcubed.org.